BEAVERTON, OR--(Marketwire - May 19, 2008) - VTech® Communications, Inc. (a wholly-owned subsidiary of VTech Holdings Ltd. (HKSE: 303) (LSE: VTH) (PINKSHEETS: VTKHY)), one of the largest suppliers of cordless phones in North America, today launched the "VTech Sisters Getaway Weekend" sweepstakes, a fun program with news/talk personalities, the Satellite Sisters, designed to highlight the importance of bridging relationships and staying connected with family and friends for life's biggest milestones. As part of the sweepstakes, consumers can enter stories about the "satellite sister" -- the person who gets you through, makes you laugh and sometimes changes your mind -- they would call first when life's best and worst moments happen. Consumers can visit www.vtechphones.com or www.satellitesisters.com for a chance to win the "VTech Sisters Getaway Weekend" grand prize, featuring a trip for the winner and her "satellite sister" to see Jack Johnson in a concert at the Gorge, a fabulous 'girls weekend' in Seattle and the latest VTech DECT phones to stay connected. "Not every conversation will change your life, but any conversation can -- that is our defining principle," said Liz Dolan, one of the five Satellite Sisters. "We believe that going through life with other people is a better way to go and that everybody needs a satellite sister -- the person you turn to when the best thing in your life happens or the worst. VTech has come up with a fun way to educate women that staying connected and learning from relationships with other women brings comfort, power and enrichment." As a leading cordless phone manufacturer, VTech's products provide the tools for personal connectivity, and the company works to educate consumers about the power of networking and relationships. Efforts include programs like the Satellite Sisters campaign as well as ongoing support of the Step Up Women's Network, an organization that helps women and girls create a better future through teen empowerment programs for underserved girls, women's health education and advocacy, professional mentorship and social networking opportunities. According to a recent survey(1) conducted by VTech, women ages 25-44 are using their home phones as connectivity tools. The survey showed women in this age category are more likely to spend four or more hours per week on their home phone for personal calls. In addition, 52% of women age 25-44 use their phones for everyday conversation and staying connected, signaling the importance of the home phone for maintaining personal connections. "Home phones are still the foundation of staying connected with family and friends," said Tom Bacon, vice president of marketing communications at VTech Communications. "With an entirely new generation of tools, cordless phone technology has never been better for reliability, clarity and enhanced features. Today you can do everything on a home phone from instant messaging to getting news/sports/weather information via the Internet to answering cellular phone via Bluetooth connectivity to avoid dropped calls in the house. Phone systems on the market today are not your mother's cordless phones." VTech's new line DECT 6.0 cordless phones are available at retail outlets nationwide and include the DS6121 for the best sound quality, security and range in cordless phones; the LS6117 that can be customized with special graphics to fit personal styles and room decor; and the IS6110 featuring a full QWERTY keypad for free instant messaging capabilities. The "Sisters Getaway Weekend" sweepstakes launches on Monday, May 19, and runs through Friday, June 27. To participate and for more details on participation and the grand prize, visit www.satellitesisters.com and www.vtechphones.com, or download the Satellite Sisters podcast via iTunes in the "kids and family" section. VTech is one of the world's largest suppliers of corded and cordless telephones and a leading supplier of electronic learning products. It also provides highly sought-after contract manufacturing services. Founded in 1976, the Group's mission is to be the most cost-effective designer and manufacturer of innovative, high-quality consumer electronics products and to distribute them to markets worldwide in the most efficient manner. For further information on VTech and its array of products, please visit www.vtechphones.com. Launched in 2000, Satellite Sisters is a multimedia brand, encompassing podcasts, live performances, a website, an email newsletter and a popular book. It is now one of the most downloaded talk shows for women on iTunes. Created by the five Dolan sisters initially as a radio show that ran for years on public radio and ABC Radio, Satellite Sisters has now won eight Gracie Allen Awards from the American Women in Radio and Television and was nominated for a Marconi, radio's highest award. The five Dolan sisters have also written monthly columns for O, The Oprah Magazine and Working Mother Magazine. Satellite Sisters is produced at The Paley Center for Media in Beverly Hills, California. The Satellite Sisters are Julie Dolan, Liz Dolan, Sheila Dolan, Monica Dolan and Lian Dolan. For more information, go to www.satellitesisters.com. 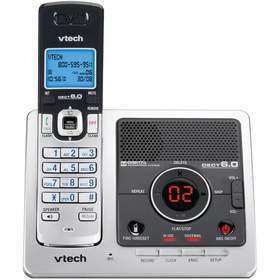 The new DS6121 by VTech--offers the best sound quality security and range in cordless phones. Julie Dolan discusses the importance of staying connected.